Hey everyone! So I was doing some looking around on Wanelo and I found some really cute stuff! If you don’t know what Wanelo is, check out my other article Wanelo. So, now to the good part! 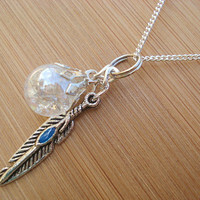 Check out these cute nature inspired necklaces! 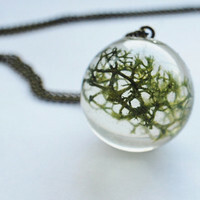 Each have a little piece of nature in a small glass orb on a chain. They’re a little pricey but they’re worth it! I mean, look at them! Very cute and a good conversation starter. Plus, they’ll go with pretty much any outfit.Wanna buy one? Click here. Isn’t this gorgeous? 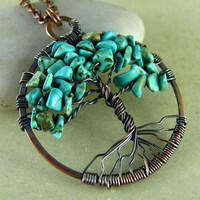 This tree of life pendant is made of hand forged copper wire and genuine chips of turquoise stone. This wire work is truly beautiful, don’t you think? Anyways, you can grab one of these for $30. Wanna buy one? Click here. FEATHERS! You just gotta love feathers! They complement any look and this cute piece is no different! This necklace is a great addition to your jewelry box. (And hopefully mine too!) The marble is fried, creating cracks and fissures inside, to give each one a truly unique and beautiful look. You can get one for only $7.25! Want to buy one? Click here. Good day! I just want to offer you a huge thumbs up for the great information you’ve got right here on this post. I’ll be returning to your site for more soon.